I suppose a ceasefire is out of the question, yeah? Sega Does commenter goldenband remarked about Granada, “Awesome free-roaming shooter that’s probably my favorite of its kind on the Genesis (not that there’s anything else quite like it).” Another commenter, boombafunk, called it “criminally underrated” and said that “Granada is amazing, probably my favourite game ever.” Few games have received such high praise from readers. Fewer still warrant the praise. 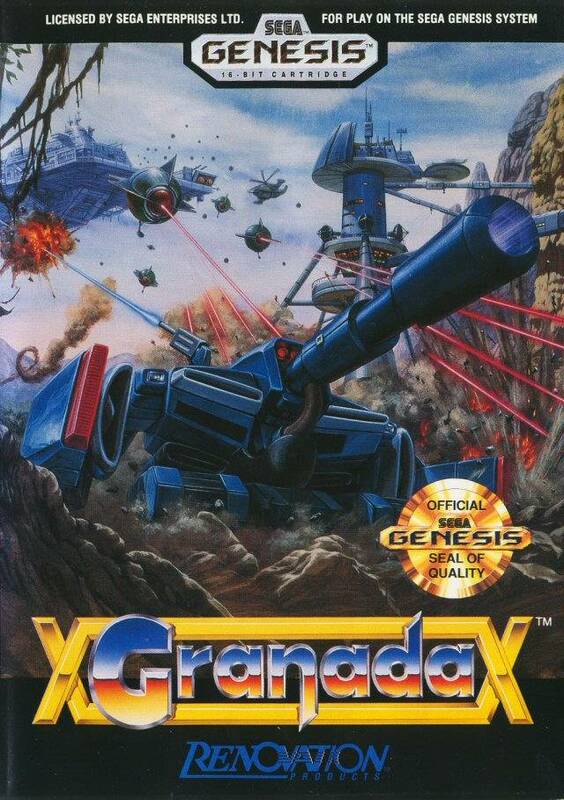 I wouldn’t go so far as to call Granada my favorite game, let alone my favorite shooter, but it is one that deserves more attention and respect than it currently receives. Clear your mind of that awful “Camp Granada” song. Granada is not a place, but the tank that you control. The game really hypes the tank up too. 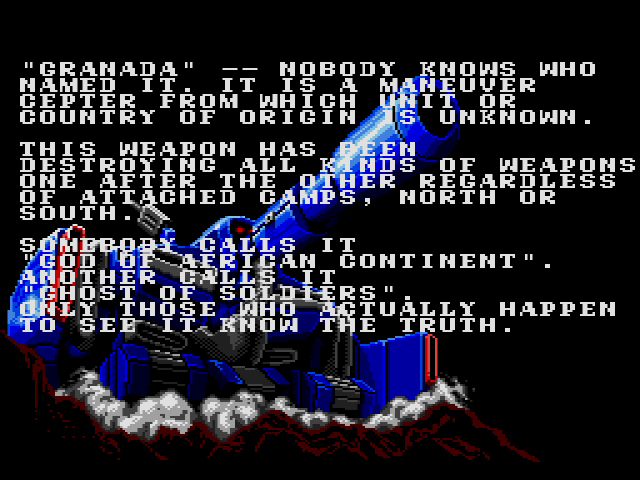 In the instruction manual, it’s called a Hypertek-Cannon Tank; this fancy name means nothing, but doesn’t it sound like it was assembled in a Cyberdyne lab? Granada is also called “Ghost of Soldiers” and “God of the African Continent” in the game’s opening sequence, but I found little evidence for either of these… I think Granada never visits Africa, let alone becomes the god of the region, and I’m pretty sure a “Ghost of Soldiers” doesn’t actually exist. U.S.S. Granada sails towards imminent destruction. You control Granada around nine top-down, free-roaming wastelands. In each area, your mission is to destroy a number of powerful enemy targets, as highlighted by the red dots on your in-game map. You’re able to explore the entire level right from the start, so you can attack the dots in any order you’d like. Granada has two attacks, an unlimited rapid-fire bullet stream, and unlimited charge blasts. The blasts are 16 times more powerful than your bullets, but they cost precious milliseconds to recharge; use them wisely. 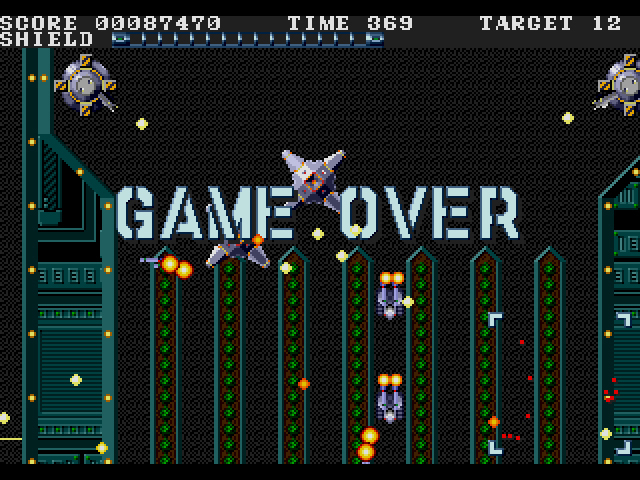 You control both Granada and your bullet trajectory with the D-pad. This feels awkward at first, but you get used to it. To unleash hell in a specific direction, hold ‘B’ to keep your bullet stream locked in place. There are no power-ups for your main weapons, but there are five secondary options that will help you wipe out the threat in each area. Three of the options – Reflector, Chromlek, and Hidden – will linger around Granada and destroy any enemies that come near it. 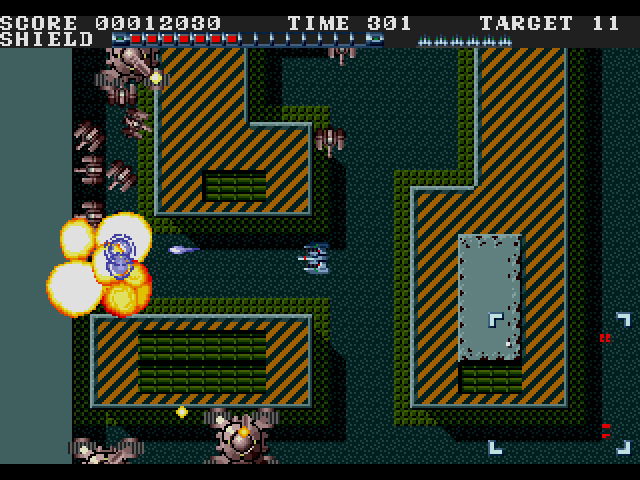 Paul-vanian works as both a front-facing shield and a long-range attack, while Epalet fires homing missiles. Only one of these options is available per level, and while they’re not always in easy to find places, it does pay to look for them. So Granada’s a sweet tank with some sweet weapons, and he’s out to destroy some bitter futuristic machinery. How is this different from the glut of mediocre shooters on the Genesis? Let’s discuss. #1: The environments are immersive. The nine stages are either visually outstanding (shout-out to stage 2 where you’re fighting on top of a massive plane), contain well-constructed, non-linear environments, or both. In order to find the red dots, you’re often forced to navigate around blocked-off areas and through narrow passageways in the war-torn city or alien landscape or wherever Granada happens to find himself. I do wish Wolf Team would have injected the environs with a little more color, but that’s a minor complaint. #2: The action is seamless, intense, and satisfying. 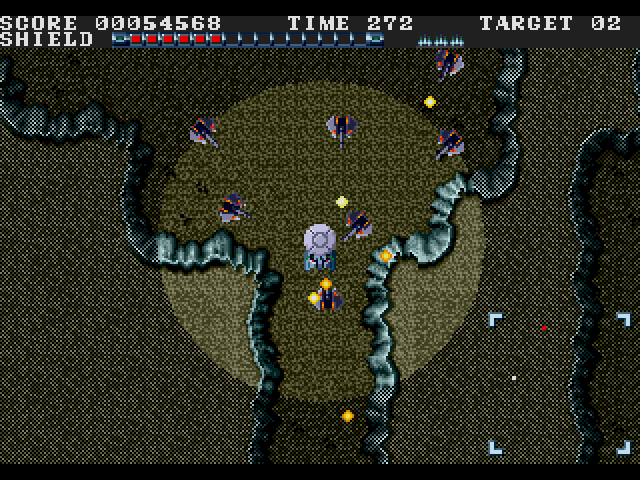 While your main targets are the red dots, there are several other enemy types scattered everywhere across the map. These range from tanks the size of Granada to even larger weapons of destruction. 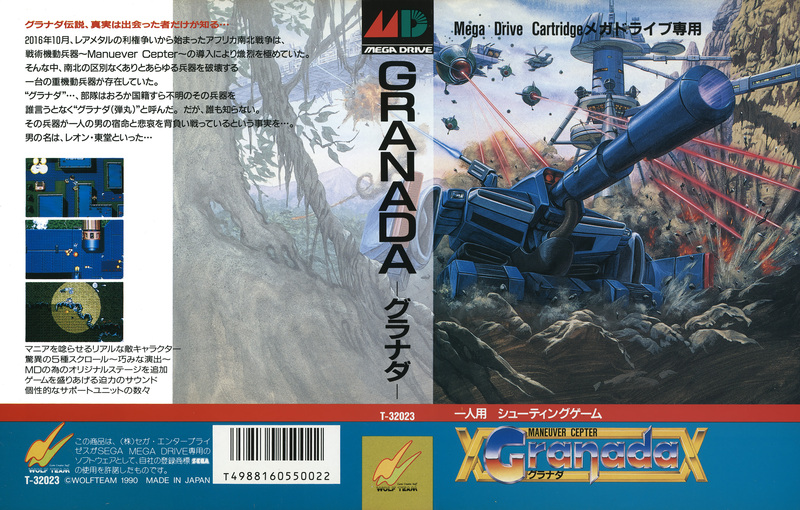 Granada’s quick movements, fast firing ability, and the unceasing enemy threat make for constant tension. 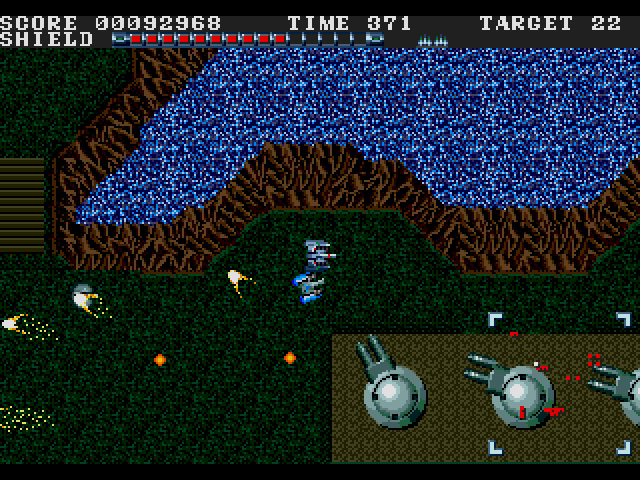 Around each corner is another skirmish, with tanks and mines and homing missiles sailing towards you. 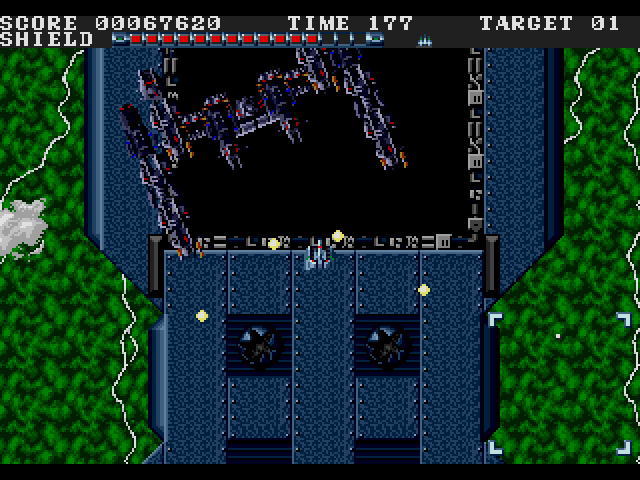 No slowdown either, even when there’s collateral damage on every part of the screen. There is a timer, but unless you’re completely lost, you should be able to beat the boss with time to spare. #3: The bosses require thought and effort. In most shooters, bosses have one very obvious weak point. Granada‘s bosses have weak points, but they’re not as easily discerned. 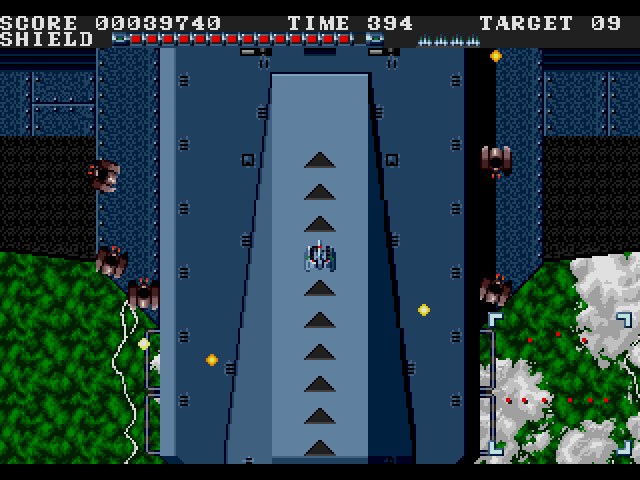 And depending on the boss, you’ll sometimes have to shoot a less obvious place in order for the boss to reveal the main weak point. 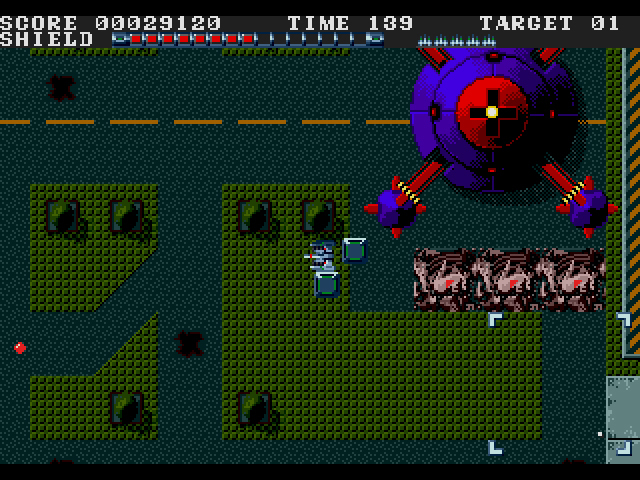 Occasionally, the bosses will chase you around your environment because they’re (presumably) piloted by bloodthirsty robots with a sincere hatred of tanks. Basically, the bosses do things you wouldn’t expect, and that’s refreshing. Judging by this screenshot, I’m not surprised. Good shooters are about feel. They draw you into themselves with little effort. Not because they’re necessarily breaking new ground, but because the controls, the ship, the weapons, the stage design, the challenge, everything just flows together into a beautiful explosive soup. Granada has that feel. Best shooter ever? Not even close. It’s a damn good one, though, and worthy of a closer look. I’m obviously in a minority on this, but I don’t rate this game as anything more than just above average. It felt like Wolf Team (ain’t that a awesome name for a developer?) reskinned Final Zone into a top down shooter. The games feel very similar in my opinion. I found myself wrestling with the controls in the same way as Final Zone. I also found the graphics rather bland, but on a positive note the action was unrelenting and the sound was pretty good as well. But hell I’m gonna say it..:.. I preferred Final Zone. After years of searching through Genesis online reviews, Genesis bargain bins at Funcoland, thrifts, and mom & pops, looking for great games with little coverage, Granada stands among similar unknown greats like Sorcerer’s Kingdom, Jewel Master, Atomic Runner, Twin Cobra, etc, etc…Renovation collectors have made it rather expensive at last look, but hey, I can’t knock ’em for liking the publisher’s Genesis catalogue. I guess I’m one of them too. This just reconfirms my need for this game. Good write-up.